We’d love your help. Let us know what’s wrong with this preview of Nemesis by J.M. Dillard. Remus -- mysterious sister world to Romulus. A planet where hope surrendered to darkness long ago. A planet whose inhabitants have been without a voice for generations. But that's about to change. Earth -- home to Starfleet, where the crew of the "U.S.S. Enterprise(TM) " NCi1701-E, gathers under the crystal blue skies of an Alaskan day to celebrate the wedding of Will Rike Remus -- mysterious sister world to Romulus. A planet where hope surrendered to darkness long ago. A planet whose inhabitants have been without a voice for generations. But that's about to change. Earth -- home to Starfleet, where the crew of the "U.S.S. Enterprise(TM) " NCi1701-E, gathers under the crystal blue skies of an Alaskan day to celebrate the wedding of Will Riker and Deanna Troi. The joy of the day is overshadowed only by the knowledge that this is the last time they will all be together, as soon-to-be Captain Riker and his ship's counselor, Deanna Troi, will soon be departing for their new ship. To ask other readers questions about Nemesis, please sign up. Dillard does the best she can with this story, cutting a quick pace to cover a weak screenplay. Also, she's able to delve into the internal psychological issues of Picard and his clone more effectively than the film can, since she's able to give us their thoughts. The big problem, however, remains: the story has no momentum. All the scenes and subplots are so loosely connected, you never exit a scene saying, "Wow, I can't wait to see what happens now!" You simply move on to the next bit, which se Dillard does the best she can with this story, cutting a quick pace to cover a weak screenplay. Also, she's able to delve into the internal psychological issues of Picard and his clone more effectively than the film can, since she's able to give us their thoughts. What I really though was excellent about this novelization was the in-depth information. The film never really went into any detail about why Shinzon did what he did, what Remus was like, it's conflict with Romulus or what all the underlying antagonism was about. The book did in, a greatly detailed way. I have always enjoyed backstories, and books that explain long unknown facts, and this book did both of those things very well. It might have been an abridged audio, but it didn't feel that way - and was really good! Ein Meisterwerk in bester Tradition des Star Trek. Piccard trifft auf sich selbst und doch nicht auf sich selbst. Die Romulaner haben einen Klon des Captains geschaffen um die Föderation zu zerstören. Dieser Klon wurde in romulanischer Tradition erzogen und später als man ihn nicht mehr benötigte in die Zwangsarbeiterkolonie von Remus geschickt. Remus die geschundene Hälfte des Romulanischen Reiches wird in diesem Buch als genialer Einfall eingeführt. Die Remulaner stehen gegen Romulus auf und gew Ein Meisterwerk in bester Tradition des Star Trek. Die Romulaner haben einen Klon des Captains geschaffen um die Föderation zu zerstören. Dieser Klon wurde in romulanischer Tradition erzogen und später als man ihn nicht mehr benötigte in die Zwangsarbeiterkolonie von Remus geschickt. Remus die geschundene Hälfte des Romulanischen Reiches wird in diesem Buch als genialer Einfall eingeführt. Die Remulaner stehen gegen Romulus auf und gewinnen die Oberhand. Der angesprochene Klon, übernimmt die Herrschaft und will nun seine Aufgaben zu Ende bringen. Mit einem Trick gelingt es die Enterprise in das Romulanische Reich zu locken, wo Piccard auf sein Ebenbild trifft. Man kann sich sehr gut vorstellen, wie es in diesem Captain zugeht, der immer den perfekten darstellt - aber alle echten Fans von TNG wissen, dass er Einiges hinter sich gebracht hat, das er nicht gerne sehen möchte. Und dieser Klon stellt es ihm bildlich vor Augen. Die Kernfrage die sich Piccard aufdrängt: Wieviel von dem was er in diesem Spiegel sieht ist er und wieviel davon ist durch das gänzlich andere soziologische Umfeld geprägt? Wäre er selbst zu ebensolchen Taten in der Lage gewesen? Hier kommt auch die einzige Schwäche des Buches zum Tragen: Aus diesem Konflikt hätte man viel mehr machen können. Der innere Zweikampf von Piccard wird zwar stellenweise angedeutet, aber nicht entsprechend gut ausformuliert. Es kommt ganz klar durch, dass es sich um die Vorlage zu einem Film handelt, in dem genau dies natürlich keinen Platz findet. Dafür allerdings gibt es auch diesmal wieder gut geschriebene satte Action und am Ende auch den (dauerhaften?) Abgang eines Mitglieds der Brückencrew. Positiv hervorzuheben bleibt noch die Tatsache, dass der Autor sehr gute Beschreibungen der Vorgänge während des Drehs mitliefert. It’s not entirely Dillard’s fault. The Next Generation in print suffers from the same malady as it did on TV and screen: Outside of Picard, there’s no interesting character to build a story around (and don’t give me any guff about how “cool” Worf is – what Paramount did to the Klingons is a crime – no, scratch that, what they did to the Klingons was a misdemeanor; what they did to the Romulans is the crime, and Michael Dorn is not that good an actor). And the material the author was given was pretty lame to begin with. But if she were a better writer, she would have made reading it (and listening to it) fun. A pleasant diversion, at least. The reason I like reading the movie tie-ins is they give extra information that gets cut from the screen, like the Romulan chef who cooks for Picard in the Senate has interstellar experience, making the meal enjoyable and not Reman Spartan like he was expecting. Apart from that, this book has two other things that add appeal for fans: an introduction by John Logan, who wrote the Nemesis screenplay, which shows how the story was developed; and unit publicist Michael Klastorin has written a backsta The reason I like reading the movie tie-ins is they give extra information that gets cut from the screen, like the Romulan chef who cooks for Picard in the Senate has interstellar experience, making the meal enjoyable and not Reman Spartan like he was expecting. This is about the future regarding a Space craft called the Enterprise which undergoes a war unlike any other. Captian Picard is faced with the situation of saving the universe from an evil source named Shinzon. This one man becomes a threat to every one on earth and in space. The enterprise fights another battle but this one answers the question of "is this the end?" I thought both the book and movie were pretty good. They're both action-packed and have detail on every aspect of the story. 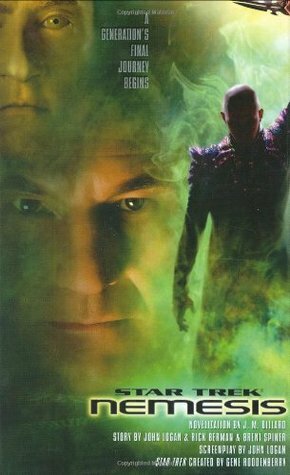 What can you say about the novelization of the worst Star Trek movie? That it was still better than Enterprise? That the book was better than the movie? It really wasn't .. both were equally horrid and poor ways to end the TNG series. I can't blame the author ... he didn't have a lot of anything that made sense to work with. This book is only for the completist out there. A decent adaptation of the film. There's a few extra scenes to do with character and leading on to the Titan series of books. What jarred with me was the mention of Wesley Crusher in starfleet, apparantly due to serve on the Titan. Considering hes a super powered being I seriously doubt that. The rest of the book seemed good with character, especially Picard and Riker. A good read. Good book, good movie. Picard's a pimp. Shinzon's a sweet bad guy. Story has great themes. Family is a clear theme. Another is that of separate paths or duality, I don't know how to explain it. There is Picard, and his clone, there similarities and differences... Data and B4, Romulans and Remen's, etc. Good stuff. The problems with this novelization stem directly from a sub par movie script and not the author. She does the best she can with weak material and manages to make the story much more exciting, and involving, than the live action version. This was much better than I expected it to be. It helped to fill in some of the gaps in the movie. 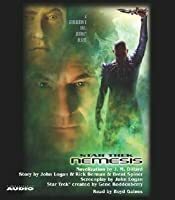 Nemesis is a flawed story, but it does provide some closure to the TNG era. The book helped me to appreciate that more. If you've got a few hours to kill, I think it's worth checking out. I happy to be a big fan of the movie, and the book does a good job capturing what makes it work (contrary to popular opinion), plus adding material from the John Logan screenplay that didn't make it to the screen. Why do I get the feeling this is going to take several books to try to repair the stuff caused to the canon by this movie... at least this book didn't involve an idiot director who refused to do any research on the series, so at least that book has that going for it. can understand why this film was suppose be so badly thought of. as usual the book has more detail and some lovely photos. i liked it am i the only one that did? The book's better than screenplay or movie. Action packed story with great narration that made me want to watch the movie. I really liked the book after being terribly disappointed with the movie. We see more of the ensemble cast of characters and better characterization and context then the oddly directed action movie. terribly awesome. as audiobook, voice actor was great. wonderful for long driving. J.M. Dillard is the pseudonym under which Jeanne Kalogridis (b. 1954) publishes her Star Trek novels.